Ok, laugh all you want, but this time last year I had never cut a fresh pineapple before and didn't know how! In fact, I didn't think I was a pineapple fan. I remember the bits in fruit cocktail when I was little "hurt my tongue" so I always avoided it. If I needed it in a recipe I'd use canned. Well, no more! Every month or two (more often in the summer when we're craving fresh fruit) I grab a pineapple when they're on sale ($2.99 in my store). It tastes a lot better and you get more bang for your buck! Johnny and I enjoy munching on the slices as a side to breakfast or lunch, a light snack, or dessert after dinner. Since the fruit has already been processed and is in an easily accessible container it's a cinch to grab when the mood strikes! 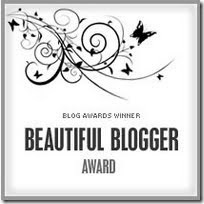 Miss Spiceaholic at Spice's Bites has awarded me with the Beautiful Blogger award! Thank you! I have to list 7 facts about myself and then tag 7 other bloggers. 1) I'm currently enrolled in school again, going for my Bachelor's in Hospitality and Tourism. My plan is to open an Inn with a small restaurant that serves breakfast and lunch. I want some hens and pigs and a large garden. The garden and hen's eggs will supply the restaurant and any scraps accumulated will become pig slop or compost for fertilizer! 2) You already know I don't like mushrooms or raw tomatoes, but another disliked food is raw oysters. Ugh, their texture is like swallowing a big loogie! 3) I haven't had my hair cut by a professional since 2001 or 2002. My mom, aunt, or Johnny trim it for me every once in awhile and I'll thin it with thinning shears. Twice I've gotten bored and cut it myself - last time was 2006 and I donated 14" to Wigs for Kids! I just don't trust salons anymore because they don't listen and never know how to treat my curly hair. 4) I don't have a birthmark. 5) I've never gotten an F, I'd probably have a nervous breakdown if I did. 6) I've never been to a tanning bed and the thought freaks me out. I think of them as being enclosed in a glowing coffin. 7) I don't know how to drive stick, but fantasize learning (among other things) so I can be prepared for The Amazing Race. Instead of tagging 7 bloggers I'm going to tag each of you to leave one fact about yourselves in the comments! I have a birthmark on my left hip! Thanks so much for posting about how to cut a pineapple! I LOVE fresh pineapple and always buy it already cut up,which is way more expensive. Now I wont be afraid to try cutting my own!! Also, I forgot to add about sprouting the top. I read it can just grow, but it won't produce fruit. A pineapple isn't asexual, it needs a male and a female plant to flower so it will just look like the frawns on the top, no fruit! Hm, one thing - I enjoy cleaning out my closets. I love getting rid of clutter. Hee hee, it's surprising how many people don't know how to cut pineapple, and find them intimidating! This tutorial has made me realize how much I miss pineapple rice! Hmm...must make someday! Fact abt me: I don't use any make-up or special facial cleanser, etc...just vaseline and chapstick! I can't be bothered with lady-stuff. I actually didn't know there was a real way to cut them - thanks! I know how to cut a pineapple...but I HATE doing it. Just makes such a mess it seems! I can taste pineapple just looking at these pictures! In Costa Rica we had white pineapple...never saw it before or since, but it's delicious. Fact? Hmm. I love every single food I've ever tried - except celery! I'm not kidding, celery makes me nauseous. Too bad, because it's such a nutrient-packed food. Cutting up a pineapple is one of my favorite things to do ever. It is so fun! Also, weird, Patti- I ALSO have a birthmark on my left hip. p.s. you just won an award at my site! I LOVE fresh pineapple too. I bought one for the first time last summer and my kids loved it. I have cut SO many pineapples because it's one of my faves, but I never knew that trick about the top! Intresting how everone has a different way of cutting a pineapple, I had lots of experence when my wife was pregante this was her craving of all the things to crave. 1. I'm a small businessman, employee 30 people. um i love your hair! it looks awesome! but you are totally right about how hairdressers dont know how to treat curly hair, my little sister has curly hair and always has problems finding a hairdresser..